The Kardashians — America’s first family of WTF? reality show programming — is apparently eager to blast off into space. Kris Jenner is said to be keen to fly the family further than she ever has before to shoot an episode of Keeping Up With the Kardashians – which recently celebrated its 10th anniversary – on Richard Branson’s Virgin space shuttle. An insider close to Kris told heat magazine: “Kris is fascinated by outer space, and is looking into paying for her and the family to be among the first passengers on Virgin’s commercial space shuttle. “Kris just signed a $150 million deal that will keep their reality show until the end of 2019. The pressure is on to keep things exciting, and what better way than by filming an episode in space? If they want to orbit the Earth, they shouldn’t be talking to Branson. 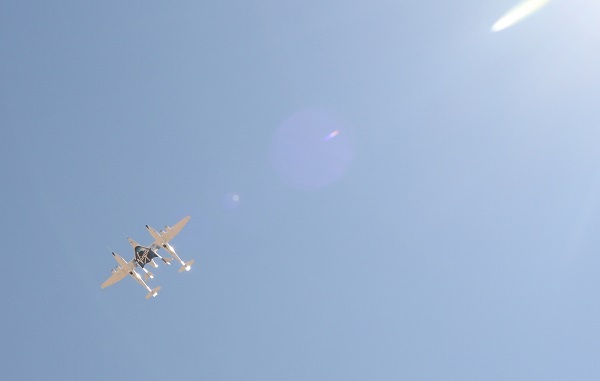 SpaceShipTwo will only get them about four to five minutes of weightlessness in suborbital space. Hopefully that would be enough. But, then again, when is anything ever enough for the Kardashians? Their appetite for money, fame and attention seems as boundless as space itself. So i’m torn over this, i’m glad to see (assuming this is true) that people with the means are really prepared to spend money on space tourism, but do the Kardasians have to be the ones to blaze the trail? IKR. Think of it as crowdfunding by millions of their viewers. After this all they can go back to is making pornos. I’m torn because I don’t root for rockets to fail. SS2 doesn’t even make it to the Karman line, either way the hot mess comes back at us. Welcome to the horrors of the future we’ve all dreamed of. With space being accessible to the masses, it won’t be our exclusive club anymore. Nothing lame about such an outcome, more a service to mankind! Meh. I’d be torn if it turned out that they were the customers for SpaceX’s circumlunar flight! I was actually wondering this myself.. but are they really that brave? Considering how safe and reliable that vehicle will turn out to be (if it ever goes into space) I’m all for it! You beat me to it, dammit. They couldn’t have picked a better vehicle. But you have to admit they are a perfect match for Sir Richard and VG.